Friday, January 23, 1914: Don’t remember what I did today. My memory is rather leaky. Sounds like a slow day. Since Grandma didn’t write much a hundred years ago today, I’ll share some dress pictures from 1914 issues of Ladies Home Journal. This is the fourth year that I’ve shared dress pictures from Ladies Home Journal. You might also enjoy some of the previous posts. Posted on January 23, 2014 May 24, 2016 by SherylPosted in FashionTagged 1914, family history, genealogy. Next Next post: Getting Old? Sometimes it seems strange to me to think that Grandma was writing these diary entries before WWI. 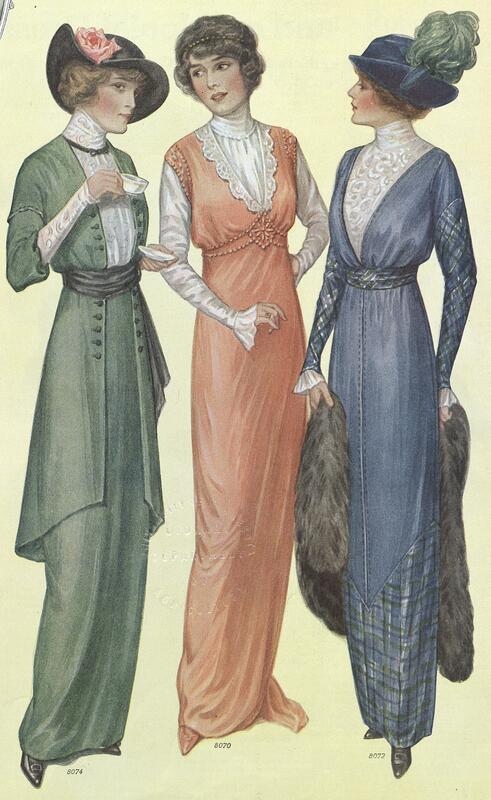 I love the Victorian dresses and hats. They weren’t what you would call “practical,” but they sure were stylish. Most of all, I love what your grandmother said about having a “leaky” memory. I’m adding that phrase to my vocabulary. Cute. I love these, especially the top image, far left (#8074). I really like that one, too. I love the fashions of that time period. So beautiful but not overly impractical for the active woman. Your grandma’s phrases really make me laugh. I could visualize her sitting there and a kind of mist is coming out of her ears, her memory leaking away. Gallivanta already wrote EXACTLY what I was going to say, both about my favorite dress and my memory! I guess I need to get up earlier to beat her . . . Such an elegant time. 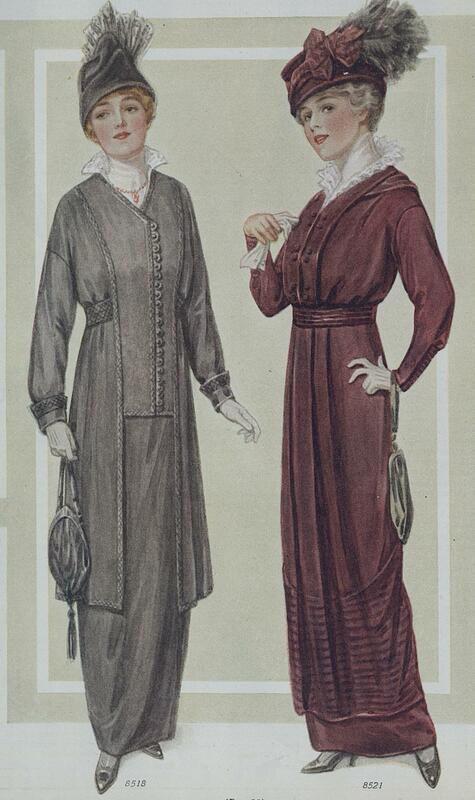 Our ancestors wouldn’t believe the way we dress these days…. But, everyone is correct with the comments that these dresses were impractical. I’m sure women of that day would have loved to have the freedom of a pair of jeans! Sometimes I feel like her diary entry. Somehow reading the old diary entries reaffirms that it’s okay to sometimes have days like this. I like my jeans and T-shirts, too. Love it! If senior citizens can’t immediately remember what they did, then they’re senile. Eighteen year olds are just leaky. I like those dresses quite a lot, actually! Thanks for sharing the pictures! Love those dresses. Do you suppose they were ready-to-wear, or patterns to be ordered? I bet you are right. . . she probably was day dreaming of “him”. The pictures are of patterns that could be ordered. I get the sense that most women were very good seamstresses a hundred years ago. My memory is leaky too Helena! Some of this dresses look like fancy nightgowns! I hadn’t thought about some of the dresses looking like they could be fancy nightgowns, but now that you say it, I can see it. Amazing – just a few years before the flappers arrived with their polar opposite fashions. It is really amazing how soon (and how quickly) after this that some some major societal changes took place. .. flappers, women’s voting rights, etc. She sounds like many of us 🙂 I love the beautiful outfits!! Yes, we all sometimes have days like this. I love Helena’s reference to her “leaky” brain. Must remember that to excuse my lapses. The dresses are lovely – remind me of Downton Abbey. I imagine that she wore clothes that were fancy by her standards to special functions, but that they were no where near as dressy as the outfits in the drawings. Probably, but I am sure she would have looked stunning in them. I’m pretty sure women didn’t wear these outfits when doing the laundry or farm work. Wonder what the house dresses looked like. Probably much less narrow and filmy for starters. In my imagination they wore practical cotton dresses with aprons around the house.